Gulmarg or the meadow of flowers is located about 57 kms south west from Srinagar and is situated at about 8694 feet above sea level. Gulmarg is popular day trip from Srinagar and is surrounded by huge crassy meadow surrounded by fir trees and snow peaks. Gulmarg was discovered by Kashmiri ruler Yusuf Shah Chak during the 15 century. Since the british era, it had been the popular hill resorts, providing softly undulating slopes and fresh mountain air away from population and pollution. Gulmarg is a small place and one can roam around the city on foot. A walk along the inner and outer ring road reveals the beauty of this place. It has the highest golf course in the world. Affarwat is the highest peak in Gulmarg and is among the popular trek near Gulmarg. Trekking near Gulmarg require army permission. Alpathar is another popular trek near Gulmarg. The recently built cable car takes you from Gulmarg to Kongdor through Seven springs and Khailanmarg to provide ultimate views of the Srinagar valley.Maharani mandir, St. Mary’s Church, Baba Reshi are some of the other religious places around. 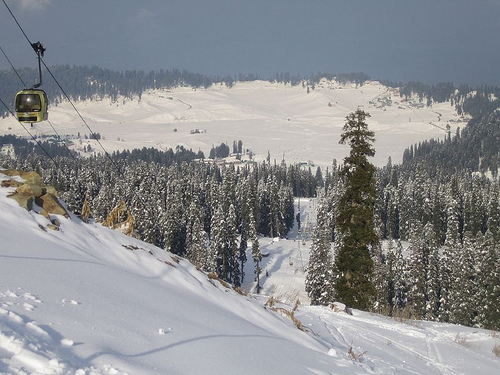 Skiing in Gulmarg has been the focus of tourism here. Its gentle slopes are perfect for first timers, while more advanced have option of slaloming down the gondola car at Kongdor. A number of people provide skiing gear on rent. If you are serious about skiing, you may as well hire an instructor for about USD 10 dollar a day. This place can be visited throughout the year, but is best during winters whenphoto from flickr user willewonker the skiing season is at its peak. Nearest airport for Gulmarg is Srinagar. 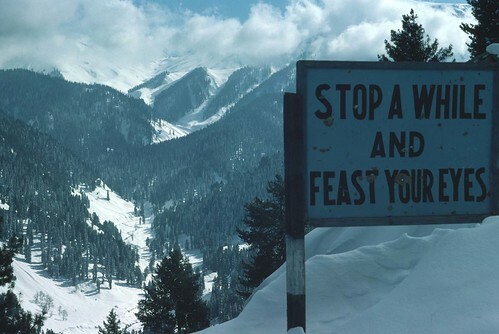 One can as well reach Jammu by train or flight and hire vehicle to reach Gulmarg. From Srinagar, Gulmarg is connected via Tangmarg.